We offer waste and recycling collections tailored to your business needs, regardless of size or industry. We collect from across the borough and offer a flexible and reliable service. Prices start from as little as £1.80 a sack. We recycle all the paper and cardboard locally, and incinerate the waste to generate electricity. We offer free paper and cardboard recycling with our service. 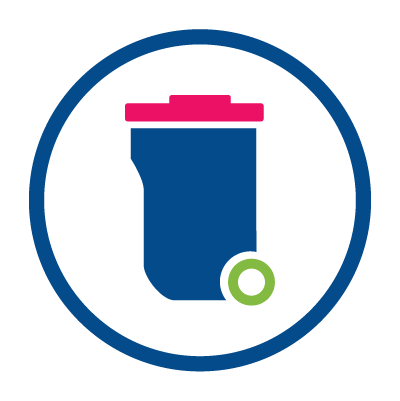 If you put all your waste in one bin at the moment, you may find that you need a smaller bin or less frequent collections when using our service as we separate waste from recycling. Our collection vehicles are split bodied which means they can collect refuse and recycling at the same time. You can choose from weekly, fortnightly and in some cases daily collections to suit your business needs. If you need a different size bin for a particular reason, we can assess the situation and may be able to offer you something to fit your needs. There are a number of ways to pay. For each you will need your account number (which starts with a 6) and your invoice number (which starts with a 2). You can pay by credit or debit card, and we accept Visa, Visa Debit and Mastercard. You can pay using our online payment system. You'll need to select Council Invoices from the list of options. You can pay using our automated payment line on 01622 602544. You'll need to choose option 6. Why do I have to pay for my refuse to be collected when I'm already paying business rates? We calculate business rates on behalf of central government and the amount levied is based on the rateable value of the premises occupied. As different types of businesses could occupy the same amount of space but produce very different quantities or types of waste, it would be unreasonable to include charges for its collection, treatment or disposal within this. I only have a very small business so why can’t I take my rubbish home and put it in my domestic bin? All businesses have a legal duty of care under Part II of the Environmental Protection Act 1990, (anyone who produces, imports, keeps or stores, transports, treats or disposes of waste has a duty to take all reasonable steps to keep it safe. This means that any waste produced by your business is regulated by law. Duty of Care applies to all businesses to engage the services of a licensed waste carrier for your business and to be able to provide waste transfer notes to this effect). Commercial waste cannot be disposed of through domestic collections or civic amenity sites such as Tovil. Businesses failing to comply with the legislation can face prosecution. Commercial Waste Solutions provides a very cost effective service for small businesses from £1.80 per sack. How do I set up a waste collection contract for my business? 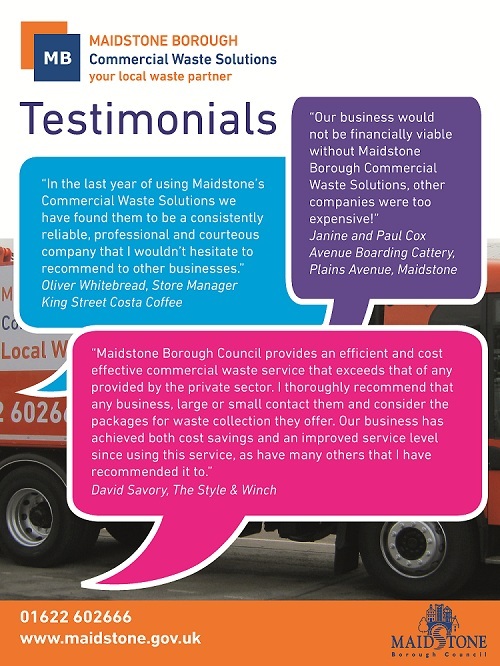 Simply contact Commercial Waste Solutions on 01622 602666 or email commercialwastesolutions@maidstone.gov.ukwe will discuss your requirements and arrange a visit, if you are happy with our proposals the contract can be signed by an authorised person within your company. The bins can be delivered within 5 days and collections can commence as soon as you are ready. We usually arrange collections weekly or fortnightly, but can be daily if necessary in some areas. We don’t tie you into long contracts, just 28 days notice if you wanted to leave us for any reason. Do I have to pay for my bins? Commercial Waste bins are loaned free of charge. Is there any types of waste I should not put in my bin? Liquids i.e. paint and chemicals, bulky items, sharps, clinical waste, hazardous items e.g. asbestos, plasterboard, gas bottles, toxic , flammable, corrosive or explosive items, or any waste that is likely to be a health and safety hazard. Commercial waste cannot be disposed of through domestic collections or civic community sites such as Tovil Recycling Centre. As a business, regardless of size, you have a duty of care for all of your waste. Every business has a legal responsibility when it comes to disposing of commercial waste, even after it has left the premises, until it is properly disposed of. Under Part 11 of the Environmental Protection Act 1990, anyone who imports, keeps, stores, transports, treats or disposes of waste, has a duty to take all reasonable steps to keep it safe. This means that any waste produced by your business is regulated by law. Know what waste you are producing – think about what you can recycle. Find the right waste contractor – are they legal, reliable, flexible? Check your waste contractors credentials – ask to see their waste certificate. Get the right paperwork and keep hold of it – always get a copy of the waste transfer note from the person who takes your waste away.